Recorders and Analyzers monitor voltage, current and power to establish baseline operating conditions or watch for intermittent anomalies. Power Factor Monitoring equipment sizes correction capacitors and confirms final results of mitigation strategies. 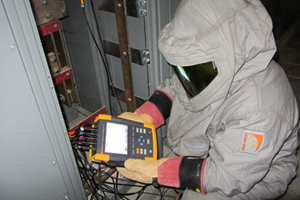 Insulation Resistance Testing locates bad or decaying insulation in wiring, electrical equipment and motors. We can test system voltages up to 5,000 volts to find defective insulation that’s otherwise extremely difficult to find. Ground Resistance Testing measures the effectiveness of grounding circuits. This ensures your critical equipment has a low resistance path to the system ground (and/or earth). Flammable liquid storage tanks, electric welding and CNC equipment are common examples where ground resistance testing equipment is used. 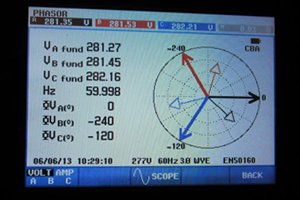 Fault Locating procedures involve injecting the underground conduit or cable with a reference frequency, then using a special receiver to “follow” the frequency from above ground. In addition, Young Electric has electronic equipment to actually pinpoint where a circuit has shorted or faulted, which greatly facilitates excavation and repair. 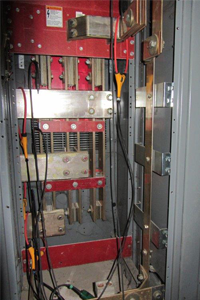 To look for the presence of system transients that may have caused premature failure of a distribution transformer, a highly trained Young Electric technician records various parameters by attaching a Power Quality Analyzer to a 480V switchboard.